With the longest binding length on the market, the F-800 series satisfies even the most unusual requirements. Due to its incredible punching power, it is possible to punch thick cardboard and even aluminium (with the appropriate lubricant). With the F-800 the operator simply has to insert the block of sheets under the carter and press on the foot switch to punch it. 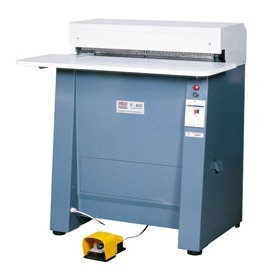 The F-800 makes punching easy, the operator simply inserts the paper under the carter and presses the foot pedal.